Lynn Ivey, founder and CEO of the nonprofit The Ivey, a Memory Wellness Day Center. Lynn Ivey had a successful 25-year career working for Bank of America, Wells Fargo and Wachovia. But then a series of life-changing experiences set her on the path to a new career and a new romance. In 2003, during her parents 50th anniversary party, Lynn saw how her mother's dementia was worsening and how difficult it was for her father, the caregiver. Then one of the defining moments of her life happened, which changed her outlook forever: She found a co-worker deceased at home. "I didn't know her well, she worked in another department, but I was out to dinner with her manager who shared she was worried about her because she hadn't shown up for a business trip," Lynn recalls. "Immediately I knew something was wrong. She lived near me so I insisted we go over to her house and then we found her. We were the same age, we were both single and we both lived alone. It was traumatic." Three weeks later, Lynn was told she needed to shut down her department and let 200 people go. Shortly after that, she was talking with her father and she could hear in his voice how much he was struggling to take care of her mother. Lynn Ivey founded The Ivey Memory Wellness Day Center as a tribute to her beloved mother, who had Alzheimer's. That's when her intuition kicked in again and she knew she had to make a change. Now Lynn is the CEO and Founder of The Ivey, a nonprofit she opened 10 years ago as a tribute to her mother and her father. The Ivey is Charlotte’s only Memory Wellness Day Center. It provides daytime care and programs for people living with memory loss due to Alzheimer’s, mild cognitive impairment, and other dementias. A talented group - including life enrichment activity professionals, on-site nurses, licensed rehabilitation services staff, and an culinary team - provide socialization, stimulating activities, healthy meals, and wellness services. These services allow caregivers to hold jobs, continue friendships, and refresh from the responsibilities of providing constant care. Details: www.theivey.com. "Alzheimer's is a disease that effects the whole family, so it needs to support the whole family," Lynn says. Lynn Ivey with her father during construction of The Ivey. Although she feels like she has everything in the world that she ever wanted, including a first-time marriage in her late 50s to the love of her life, fellow entrepreneur John Moore, Lynn does think about what's next. "I have been given so much in the way of people believing in me and donating to my nonprofit that I want to do that for others. I'm also thinking about the next generation and who takes on my business from here. But the most important thing to me now is that I spend quality time with my husband." Lynn shared some of her other passions, from her favorite beauty products to words of wisdom - and the surprising place she loves to shop - in a Q&A with The O Report. The Greenbrier resort hotel in White Sulphur Springs, West Virginia. It's like a little town. There's so much to do and so many restaurants. And the spa is fabulous. It was also a favorite place of my parents. Skinny jeans or a little black dress. My black, tan, blue, or white jeans. What’s your most treasured accessory? My engagement and wedding rings from my husband. Revision Intellishade tinted moisturizer with sunscreen and bronzer powder from Vincent Longo. For the last 10 years, sunscreen and hats. I have a brimmed hat style that works well on me. When I find something I love I buy extras, so I have them in multiple colors - orange, pink and black. What are some of the best beauty tips you’ve learned? Wash your face every night and drink lots of water. BrickTop's or Burtons Grill & Bar. What’s your favorite restaurant for lunch? The 5 Love Languages, The Celestine Prophecy and The Secret. Pretty Woman, The Bucket List and Hallmark Christmas movies. Paper invitations and handwritten thank you notes. Drinking lots of water, working out with a personal trainer at my home and walking most days. Spending quality time with my husband and my girlfriends. My wedding to my husband. Bringing moments of joy to others. I struggle with identifying and trusting my intuition. When I do, it’s always the right thing. There are no coincidences, but rather synchronistic events that help guide our life’s journey, if we pay attention. Which rules do you suggest breaking? Just believe that all is well and the best is coming. Starting a business always requires more money than you think. What's the best way to talk to someone with Alzheimer's? Always introduce yourself. Be as normal as you can. Don't ask them if they remember when something happened or an experience you shared together. We can't bring them into our world so we need to go into their world. Treat them like anyone else because they can sense your energy. In most cases, their social graces remain intact. So just smile and shake their hand. Let them introduce themselves to you. If they repeat something three or four times, just go with it. They are themselves, they're just different than they used to be. Passion, perseverance and eternal optimism. Darla Desiderio has two careers. She's both a medical salesperson and author of the Gage the Flying Whippet series of children's books. Darla Desiderio grew up in Bernardsville in New Jersey's horse country. Although it's a quaint town, it's an hour away from New York City so her style has a big city edge. When her career in medical sales meant a transfer to Pinehurst, the women she encountered on her sales calls were eager to give Darla a Southern style makeover. "Everyone from the metro area knows you always wear black," Darla says. "But these ladies would say to me, "Girl, you can’t look like you’re going to a memorial service every day. You have to get some color in your life!" Now Darla definitely has a colorful life as both a salesperson and a children's book author. She began writing two years ago after a some major life changes. "I have always had these stories in my mind's eye," she says. "I would always daydream about them. Then in 2013 my sister's husband died of cancer. Two years later, my brother's wife died of cancer. My father died this past summer. It makes you realize there is no waiting. Follow your dreams now." It was her father, Robert, who had always encouraged her to dream big. So on evenings and weekends she began writing the Gage the Flying Whippet children's book series that includes two books and a Coloring Zine, all available on Amazon and Kindle. Her third book is scheduled to be released in the spring. On Dec. 2, she'll be leading a children's coloring zine workshop at Ballantyne Reading Academy. (Details: 704-438-7909). The book that launched Darla's writing career. Her books are geared to ages 7-10. In the first one, a magical canine friend helps a young girl with dyslexia learn to overcome obstacles in her life. "I had a wholesome childhood," Darla says. "I was a tomboy - always running everywhere. I wore my hair in pigtails and I used to love to look back to see if I could run fast enough to make them fly. I was dyslexic. That was my personal struggle. I wanted to capture a time in our childhood when we face failure, disappointment and feeling alone. I wanted to explore how that impacts our self-esteem and how we overcome our struggles." A tomboy in pigtails. 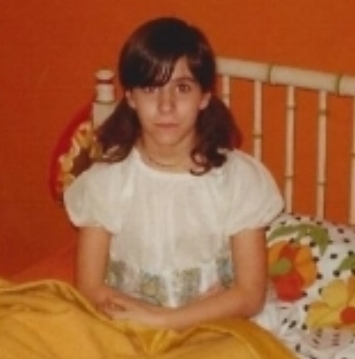 Darla around age 11 in her super groovy 1970s bedroom that she loved. As the owner of a Whippet, she chose one as a reoccurring character in her stories because they are gentle, patient, and intuitive dogs. "Their feelings are communicated through their lovely almond shaped eyes that express their every emotion," she says. "And they can run at speeds of up to 35 mph. They fly! Magical!" Darla took time from her two busy careers to answer The O Report's questions including everything from what she loves about this stage in her life to her favorite place for lunch and her must-have beauty product. I had to retire from running after a car accident in 2016, so 9Round boxing has been an excellent full-body workout. Along with boxing and weight lifting, my favorite exercise is walking my two dogs. There is no happier time for a dog than when they are on their walk. I own two dogs: Gage, a boy Whippet, and a former stray girl, Maddie. When a child tells me that they loved a book I have written. Even better when they tell me that they talked with their parents about how the story made them feel. Cultivating and embracing my quirkiness. I say use this to your full advantage. I am not saying to collect too many cats or to dismiss reality completely. Instead, let your creativity flow. Either by this point you know exactly what you want to do in life or you are thinking about it. Figure out how you want to spend your days on Earth and put the tiara on your head and begin doing it. It is your kingdom so play in it. The Sandbox. It's a charity that offers support to children with life-altering illnesses and their families. My new favorite lunch spot is SouthBound on South Boulevard. It has a getaway feel. It is authentic California street food but served on tables with service. The open air layout of the restaurant relaxes the spirit. It makes me feel like I am eating delicious made-from-scratch fare on the Cali coast! One of my favorite cities to travel to is New York City. It is like no other. A blend of gritty sexiness and sophisticated culture, it just keeps on feeding my soul. The only thing missing is the beach. The beach is a magnificent creation. It provides a peaceful and dreamy feel and of course plenty of opportunities for happy hour cocktails surfside! Boots! I love them! Suede are my absolute favorite. I love my pair of Flying Monkey brand skinny jeans. They are buttery soft and win a Tony Award for how they make my curves sing! I buy them at Jordanos boutique. What’s your must treasured article of clothing? My purple hooded sweatshirt. Because it is purple and it was created in memory of my late sister-in-law. Who has influenced your style the most? Although she is not a fashion designer, Bobbi Brown, the founder of Bobbi Brown Cosmetics. I remember when she launched her line of moderate and natural tones. I embraced her mantra of enhancing what you have contrary to concealing it. Which was not a mainstream idea at the time. Vitamin C Oil from Beauty Counter. The smell, the feel of it...a sip from the fountain of youth for your skin with every drop. I draw inspiration as an author from the botanical world. I love them all really. If I had to choose I could narrow it down to a category, wild flowers. They offer an authentic beauty fresh with color and shape in each bouquet. There is no bunch the same so the discovery is always exciting. I love the classics: Gone with the Wind, The Wizard of Oz, The Sound of Music and To Kill a Mockingbird to name a few. They communicate value propositions that with the perfect selection of principal players easily endure the test of time. Homemade popcorn, diet Pepsi, a snuggly blanket and a dog companion are a must to complete my viewing experience. I am asked this question often. I used to read a book a month. Over the past two years when life changed, and I had the epiphany to begin writing, I feel like I am always reading. I read my own stories. I read them in my head and then after I have put pen to paper I am reading them again. I am a fan of Stephen King because his characters find themselves in precarious situations, often times battling evil in the world. Although it seems throughout the novel that they won’t find a way out, in the end they do. Good always prevails in his novels. My personal design taste definitely falls into the contemporary category. With a smattering of this or that to make things interesting. Color and texture are like shiny objects that attract me like a bobbing fishing lure snags a fish. I just can’t stop staring at crystal accessories or petting the current trend of furry plush pillows. What’s your most treasured home decor item? My “eyelash” throw pillow. I discovered it a Pier 1 Imports. It is luscious! Do you have a great organizational or timesaving tip that saves your sanity and helps make your life run more smoothly? Set the coffee maker at night and drift off to sleep knowing that you can rely upon it to get you organized first thing in the morning. Late bloomers inspire me to be patient, to let my creativity flow like liquid energy. It is not that I don’t acknowledge and admire those that found their calling early in life. I do. But I'm inspired by people over 50 who discovered a whole lot of cool stuff about themselves at this time in their lives. No matter someone’s place in life, they have something of value to offer. So listen. Is there anything you loved as a child that still influences you today? What are your favorite colors? Purple because it is dreamy, red because it is passionate and silver because it is pure. Chocolate. The interesting variations of chocolate offer so many choices. The different chocolate offerings have been elevated to the level of wines and the world is better for it. I hope that my readers and their parents will remember me after I am gone as a writer that authentically created stories for their children. That I was genuine in my intent to create fictional characters and worlds that engaged their kids to use their own imaginations and believe in their own potential.